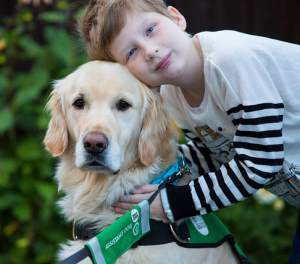 Autism assistance dog Quartz’s arrival has transformed life for the whole family. Quartz is specially trained to give confidence and security to both parent and child. With unlimited access to public places like shops, libraries and restaurants he can accompany Beth wherever she goes. Wearing a special jacket connected to both Beth and Teresa, Quartz automatically sits and will only cross the road on Teresa’s command. If Beth pulls away he’s trained to sit and prevent her moving. Find out more about autism assistance dogs for children.